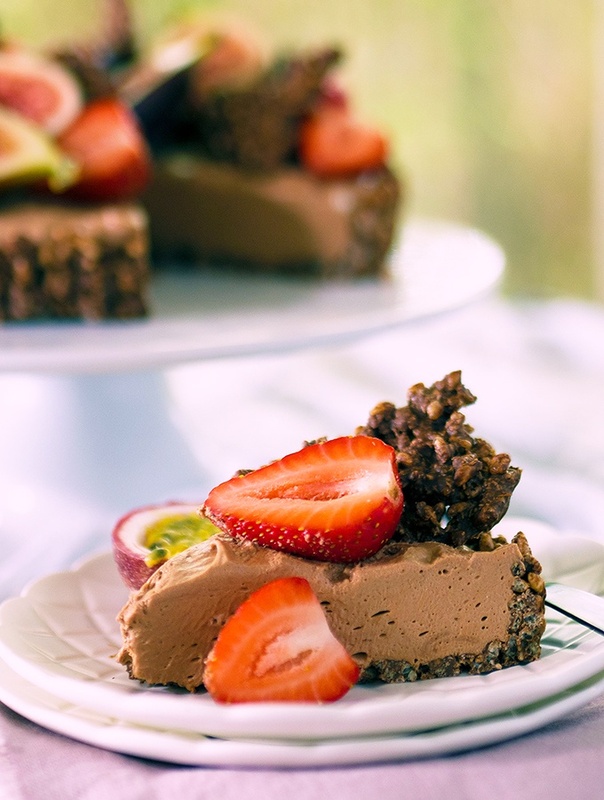 Chocolate Cheesecake Crackle Pie, luscious chocolate cheesecake, with a crunchy decadent chocolate crackle pie shell. Topped with fresh seasonal fruit and it makes for a stunning dessert for any occasion. If this dessert looks familiar you may have seen my Caramel Chocolate Crackle Tart. That was the inspiration for my Chocolate Cheesecake Crackle Pie I am sharing with you now. This crackle pie with a luscious chocolate cheesecake filling was another recipe I developed last year for a certain competition I was involved in. Now that’s all behind me, Easter is the perfect time for me to share the recipe on Belly Rumbles. It’s a great dessert for any occasion, but a complete knock out for Easter. What makes this specifically great for Easter is that you have a decadent chocolate cheesecake element filling a fun crackle pie shell. This can then be topped off with luscious seasonal fruits and berries. A dessert to make both adults and children smile. Not into fruit? That’s okay because you can decorate the top of this chocolate cheesecake crackle pie any way you want to. Decorate with flavours you love! Not into mixed berries and fruit, then why not chocolate shards and swirls, whipped cream and chocolate sprinkles, or simply dust it with cocoa. It’s your pie, decorate and top it how your heart and taste buds desire. So do tell, what would you top it with? Chocolate Cheesecake Crackle Pie, luscious chocolate cheesecake, in a crunchy decadent chocolate crackle pie shell. Topped with fresh seasonal fruit and it makes for a stunning dessert for any occasion. Line the base of a 23cm round loose base pie tin with baking paper. Spray the sides and base lightly with coconut oil spray, melted coconut oil. Add rice bubbles and coconut to the melted chocolate mixture. Mix until ingredients are well coated and combined. Press chocolate crackle mixture into tart tin. Using a butter knife to press the sides in and up first and then press the base down. You may have more mixture than is needed. Any excess mixture should be chilled in the fridge for chocolate crackle shards to either eat or add to your decorative topping (I suggest the latter). Place the chocolate crackle pie shell in the fridge to set while making the chocolate cheesecake filling. Melt dark chocolate as you did for the pie shell. Place melted chocolate to the side to cool while you continue on with the next step. In ¼ cup of boiling water add 2 teaspoons of gelatine powder. Mix well and dissolve the gelatine completely, set aside. Place cream cheese and caster sugar in a large bowl (either for your stand mixer or to use with electric beaters). Using whisk attachment, whisk on medium speed until the mixture is smooth. Continue whisking and add the melted chocolate. Then whisk through the gelatine mixture. Remove bowl from stand mixer (or place beaters to the side). Then fold through the whipped cream. Spoon filling into chocolate crackle pie shell. Smooth the surface of the pie and place in the fridge to set. The pie will be set after an hour or two. 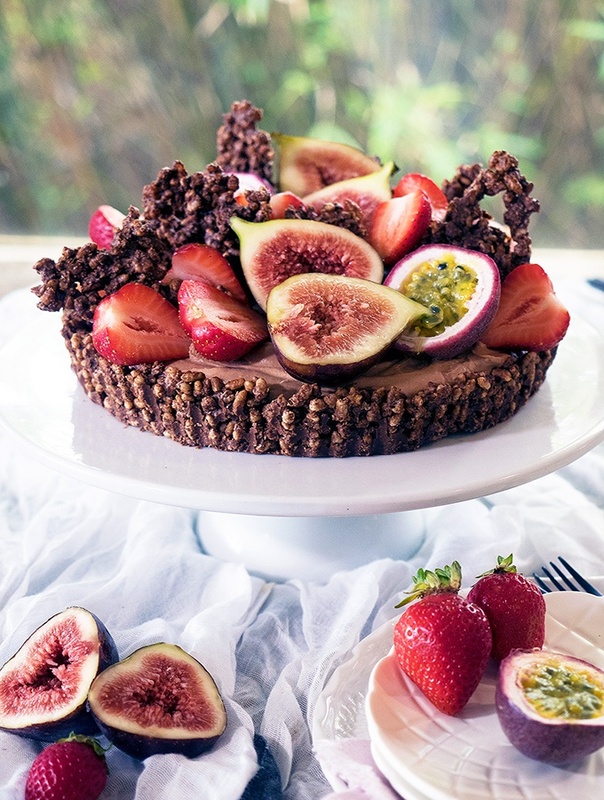 Once set, decorate with fresh strawberries, figs, passionfruit and chocolate crackle shards. 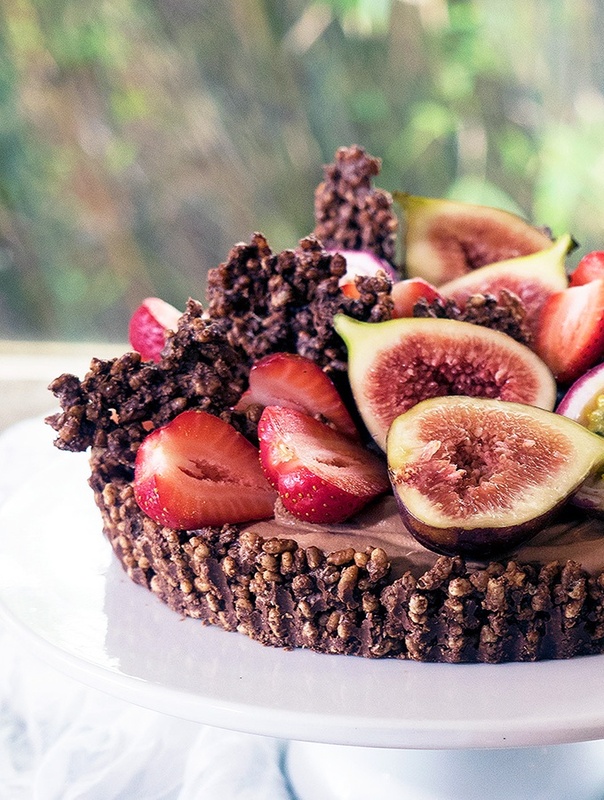 Note: Use a dark chocolate for this recipe that you enjoy eating! Not cooking chocolate. Chocolate designed for baking is perfect for that job, but with a recipe like this, where you have a non cooked chocolate pie shell. Chocolate is the main feature in the filling (which again isn’t cooked), you need to go with a great dark eating chocolate. Decorating Note: Decorate with flavours you love. Either mixed berries, fruit that pairs well with chocolate or chocolate shards and curls. You could even decorate this pie with some whipped cream and chocolate sprinkles or simply dusted with cocoa. Wow! that’s looking chocolaty. I will try it soon. This crackle pie looks really delicious that made me badly crave for cheesecake. I super love the fresh fruits added to it. I can’t wait to try this soon. I am planning to try making one in time for Easter.